The theme of the 2013 Hannover Fair – the industrial mega-show held annually in northern Germany – was the "Fourth Industrial Revolution". The 2013 show included the biennial MDA (Motion, Drive and Automation) event. In this exclusive report, we look at some of the highlights of the Fair. Visitors to this year’s Hannover Fair could not avoid references to Industry 4.0. This is an initiative, led by the German government, to promote manufacturing on the basis that it is entering the fourth significant phase in its evolution. First there was the original industrial revolution during the 18th century, triggered by the invention of the steam engine and the mechanisation of manual work. This was followed in the early 20th century by the introduction of mass production and, in recent decades, by the use of electronic and computer technologies such as PLCs to automate manufacturing. This fourth revolution is based on “cyber-physical systems”, using technologies such as software, communications, and advanced sensors to deliver the truly “smart” factory. Germany’s National Academy of Science and Engineering believes that the new manufacturing processes will lead to a 30% increase in industrial productivity. The German Government is sufficiently convinced to be investing around €200m to help trade bodies, research institutes and industrial companies to develop an implementation strategy for Industry 4.0. In his end-of-show speech, Dr Jochen Köckler, a board member at the organiser Deutsche Messe, picked up on this theme. “Over the past several days, the world’s leading trade fair for industrial technology has underscored its role as a key driver of the fourth industrial revolution,” he said, “highlighting a sweeping trend towards cross-industry networking and integration. 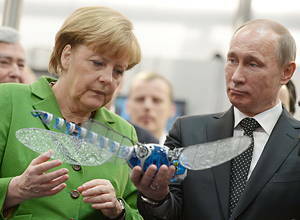 This year’s Fair was opened by the German Chancellor Angela Merkel and the Russian President Vladimir Putin (shown above with Festo's BionicOpter "mechatronic dragonfly"). The show attracted 6,550 exhibitors from 62 countries and the organisers are hailing it as the strongest Fair in a decade, which consolidated its position as the world’s leading showcase for industrial technology. There were 225,000 visitors – a similar number to the last comparable show, in 2011 ­– with a quarter of them hailing from outside Germany. About half of the non-German visitors were from elsewhere in Europe and 20% from South, East and Central Asia. In terms of innovative technologies, 2013 was not a standout year, possibly reflecting cutbacks in r&d budgets during the recession. But there were still plenty of developments to catch the visitor’s eye across the vast showground. Here, we report on some of them. ABB may not have had any of the show-stopping technologies that it sometimes unveils at Hannover, but there were several enhancements to its ACS880 drives family as well as a new high-voltage two-pole induction motor for pumps and compressors up to 13.5MW. This rugged, low-maintenance motor was developed in response to customer requests. It has a new rotor bar construction designed to withstand stresses during start-up and running. The motor can operate from 6–13.8kV supplies and is initially aimed at fixed-speed applications up to 3,000 rpm with direct-on-line connections. VSD operation is possible.